In spite of the few days of very cold weather we have recently had the jonquils are defiantly showing their glory! Gracious - I hear there is a polar blast over there! These flowers don't seem to care! Miss the colour but approve the composition! Who would have thought Jonquils could look so pretty in B & W.
Even in b & w they are lovely! Beautiful composition emphasizes the flowers against the background! Very pretty- no flowers blooming here- except of the non-living kind! looks ikebana especially with the leaves in the background. very nicely composed, girlfriend. aces! Looks great in black and white! Looking forward to warmer weather so some flowers around here can start blooming. 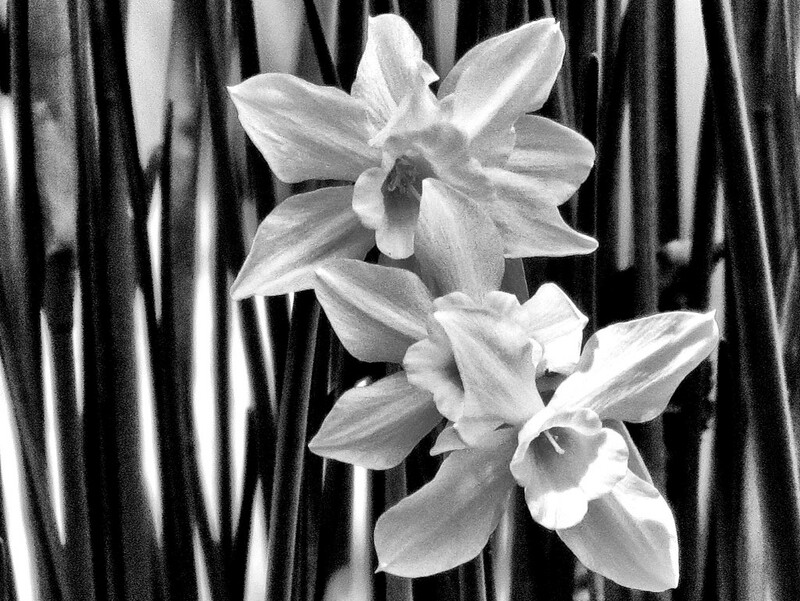 These flowers always look pretty in black and white. If course prettier in color. Amazing they make their entrance no matter the weather. @maggiemae @nicolecampbell @louannwarren @gijsje @judithdeacon @wyomingsis @olivetreeann @summerfield @luvmynynix @Dawn @ludwigsdiana @mrspedwards @lesip @henrir @sunnygirl I am so glad you like this. Thanks to each of you especially those of you that just popped in for a quick look but don't follow. Before 365 it never would have occurred to me to do flowers in B&W but as some of you have commented it works. As for those of you who are under snow and cold weather, take heart, soon you will have this very subject to shoot and mine wil be all gone! Thanks again everyone. So pretty! I like the B&W. Funny how we have spring flowers and other people are suffering record cold. @ruthmouch so terribly kind of you! Thrilled that you like it too.